Have you ever wanted a gorgeous one-of-a-kind Platinum print for your art collection? Well, here’s your chance…. Straight from my archives comes an exciting collection of Platinum prints masterfully printed with exceptional quality. Each print is 16 x 20 inch (paper size) and is signed and numbered by me, each image in its own limited edition. Choose a Platinum print from any of these classic rock masters: Jimi Hendrix, Frank Zappa, Jerry Garcia, Janis Joplin, Johnny Cash, Mick Jagger, Pete Townshend, or Miles Davis. Click here to view them all. Platinum prints are considered the Rolls Royce of photographic prints and favored by collectors for their superior tonal range, their smooth, non-reflective surface quality, and their permanence. A high quality Platinum print can last a lifetime and beyond. Platinum prints are ‘contact prints’ because the negative and the print are the same size. The actual negative is placed directly on top of the paper that has been hand-painted with liquid Platinum and Palladium. The result is a smooth, subtle, and elegant work of art. But wait – there’s more! 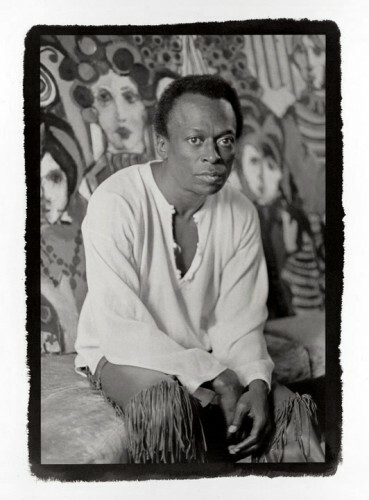 We are running a Summer Special from now until Labor Day….purchase a signed & numbered Platinum print of Miles Davis for the reduced price of $1500 (normal retail is $1800). As always, get FREE shipping in the continental U.S.
To purchase a Miles Davis Platinum print or a platinum of any of the other classic rock icons above, email me at bwolman@fotobaron.com.